"Slide in" or "Walk Thru" design legs allow EASY ACCESS to seating. No need to climb over the seats to sit at the table, and there is NO WASTED OR OBSTRUCTED SEATING SPACE. Translation? More people can enjoy your picnic! Because they are made of 100% Recycled Plastic, they will never rust, peel, or blister. Each leg is a one piece molded component, making assembling the table that much easier. The recycled plastic planking is very RESISTANT TO VANDALISM ! It's is much harder to carve than natural wood. If it does become gouged or carved, it is easily repaired with a little heat and a blade such as a putty knife. If the vandals resort to markers or paint, it will not stick! The plastic resists such markings, and it will naturally flake off in a fairly short time. If it is truly offensive and you want to remove it quickly, simple household cleaners and a brush will whisk it away easily. This plastic planking is also U V STABILIZED, meaning it will resist the effects of the suns harsh rays. This means the color will stay consistent for many years. It will only fade about 5% of its color every 50 years. Try that with paint or stain ! NO SPLITS OR SPLINTERS here ! Recycled plastic planks will simply not do that. No concern about injury from slivers or being pinched by splits in the boards. Safety and comfort are incorporated automatically with recycled plastic ! NO CHEMICALS TO LEACH OUT like that in treated wood. Feel safe placing your food on our tables, there's no dangerous arsenic, copper, or chromium in our recycled plastic planking! It is also UNAFFECTED BY MOST CHEMICALS and SPILLS ! Whoops ! Someone spilled the catsup? A glass of juice? Somebody used it as a work bench? Not to worry. The recycled plastic resists staining from almost all foods and chemicals. Simply wash away accidents with soap and water. NO INSECT PROBLEM here ! They just don't like plastic. 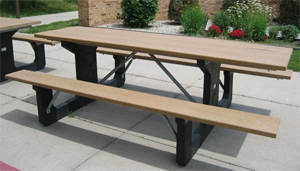 Never worry about termites and other insects making a meal out of your picnic table. The Super Duty frame is made of STRUCTURAL STEEL TUBING, not pipe. That means it is much stronger than traditional frames that appear to be the same. Our simple and unique support system reinforces the seats and table top, adding dramatically to the overall strength of the entire table. Welded one piece sub frame components add STRENGTH and simplify assembly. They also add tremendous resistance to abuse and vandalism. It's nearly abuse proof! The finish on the sub-frame is HOT DIP GALVANIZED, not paint! This means you'll have a superior coating that will look new for many years to come. It's much more durable than paint, and full 100% coating coverage is assured by the hot dip process. No bare or thin spots like painted frames. Simply stated, this is no ordinary picnic table! Is your environment more demanding than most? You can opt for the HOT DIP GALVANIZED finish, ideal for harsh environments. It is very good where placement may be where salt air is a factor. This hard wearing finish is applied after all fabrication and welding is complete to assure 100% coverage. Super Duty Walk Thru Tables have black legs and available seat colors are Cedar (butterscotch), Green (forest green), and Gray (cement) and Brown.